Is a concentrated magnesium, manganese and zinc which is highly effective for deficiency correction or prevention in a wide range of fruit and vegetable crops. 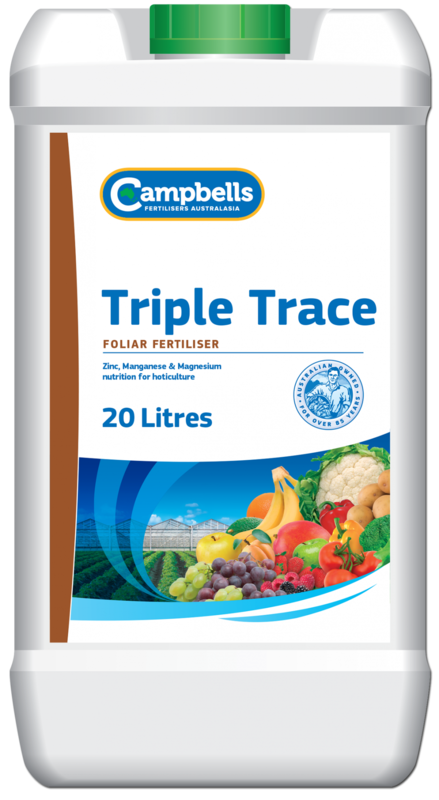 Campbells Triple Trace is a concentrated liquid formulation that provided a high level of magnesium, manganese and zinc pre flowering and through the reproductive phase of the crop cycle. It is designed to be absorbed by the plant foliage and will not cause burn or scorch when applied at recommended rates. Campbells Triple Trace is suitable for application via foliar spraying or fertigation. It mixes rapidly and completely and remains in solution ready for absorption via leaf surfaces or can be applied to the soil via fertigation providing a combination of three essential nutrients. Campbells Triple Trace can be applied via fertigation for horticultural crops at between 5-7 Litres/ha in field crops. Foliar applications can be applied at 5 Litres/ha. Specific rates will depend on the crop, stage of crop development and application method. Foliar applications should be avoided during extremes of climate and during flowering. Before application seek advice from your Campbells Triple Trace distributor or your local agronomist.